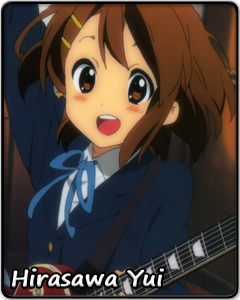 One day, a breathless Yui will run through the streets of her home town to reach a concert, her concert, in time. She will keep her gaze locked straight ahead of her and will not slow down even as she stumbles. She will grasp her dream firmly with both hands. Until that day, though, she is unlikely to display any sense of urgency (or purpose, for that matter). Yui enters high school fully prepared to drift through another three years of life. Her distinctive quality: concentration issues. Her special skill (alleged): playing the castanets. Future prospects: nothing in particular. It is good luck that her reliable younger sister is there to wake her up every morning. But people like Yui are easy pickings for obscure clubs desperate for new members, like a certain light music club. 'Non-heavy music can’t be bad, right?' That is apparently what is going through Yui's head as she signs on as a member. Or maybe it is 'They have cake!' Food is, after all, the easiest way to keep this girl's long-term interest. However troublesome she might be to the people around her, though, Yui makes up for it with her big heart. In her own haphazard way, she protects her sister’s happiness and shares her love with her fellow club members. She never hides her genuine feelings toward cake. And most importantly, she wastes no opportunity to shower her guitar with unrestrained affection. It’s a matter of opinion whether this girl is merely quirky or truly one of a kind. One thing is certain: there must be a reason why this loveable airhead gathered so many people by her side.